Family education: A child benefits the most when therapy ideas are carried out in the home environment as well as in the clinic. Quality treatment: A small caseload allows for more client/family attention. Creativity: True client driven service takes creative, playful thinking. See Services for ways we can help you. 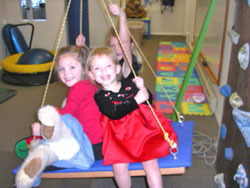 Learning is fun at Pediatric Potentials.